In the online casino world, we sometimes come across an ownership group responsible for many different casino brands. In some cases, that means nothing more than a carbon copy of one site to another with a different name and logo. The more innovative groups try to differentiate by using different software vendors, coming up with different promotions and changing the look and feel of a site, so it isn’t as obvious that it is owned by the same group (think of all the different-themed casinos owned by MGM in Las Vegas for example). 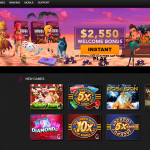 Desert Nights Casino fits into the latter category; we are going to take an in-depth look at the brand, its owners and everything it has to offer to determine if it is a legit casino for your real money play. 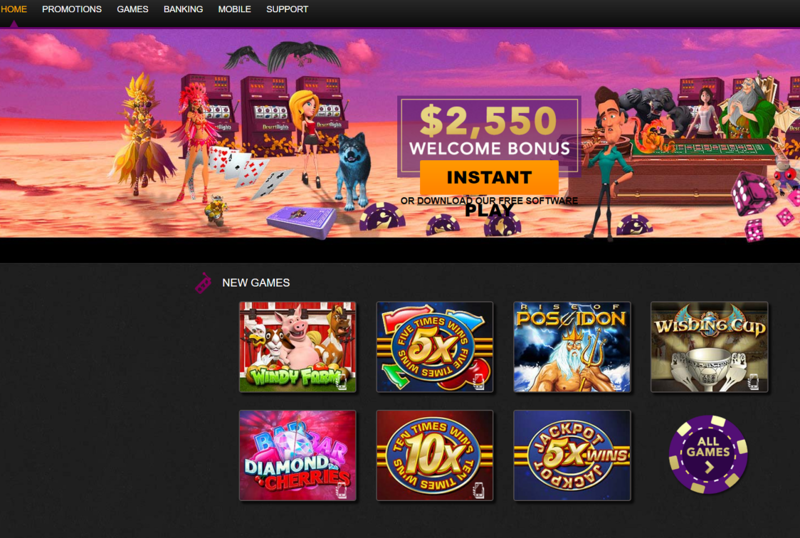 Desert Nights is one of many brands owned by the Deckmedia Group of Casinos. They own over a dozen sites, including some brands you may recognize like Spartan Slots Casino, Black Diamond Casino, Box 24 Casino and Red Stag Casino. Deckmedia is licensed by the country of Curacao, a small country off the coast of Venezuela. This Dutch colony is home to many online gaming licensees, mainly due to its loose process of keeping their casinos in check. This is a great location to receive a license if you are an operator who plans to take action from the U.S. market, as there are no restrictions on play from that country. As mentioned above, Deckmedia has chosen to differentiate by having different brands under their umbrella use different pieces of software. 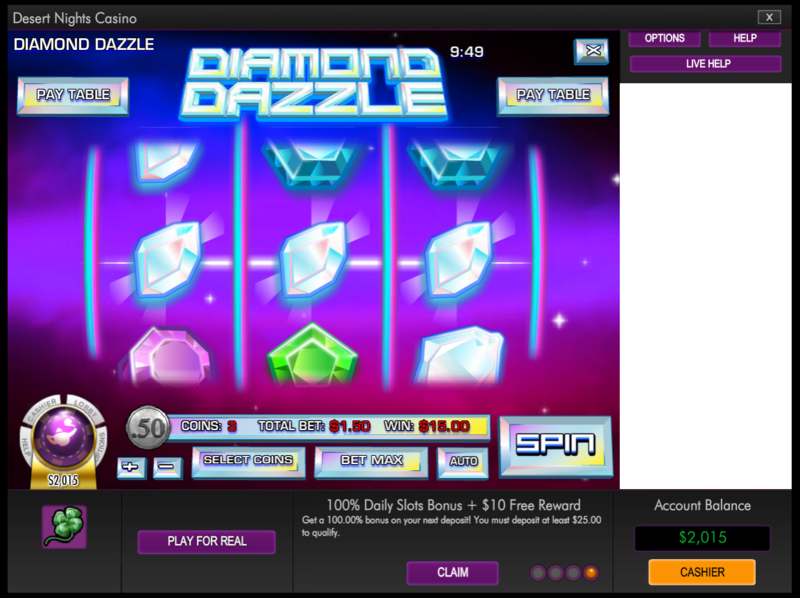 For a long time, Real Time Gaming was the supplier used by Desert Nights, but today the casino is using Rival Gaming. We can only presume the switch was the decision of Deckmedia; they still use RTG for other casinos, so it isn’t likely a fallout or violation of terms that caused the switch. Good news for all you online casino lovers in the United States! Deckmedia casinos are very U.S. friendly, and Desert Nights Casino is no exception. 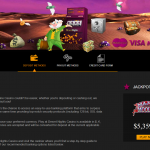 Is Desert Nights Casino Legit for U.S. Players? As there are no restrictions on play at Desert Nights for American players, it is hard not to make these guys a legit place to play for U.S. players. Having said that, there are definitely better sites as far as promotions go (you’ll see as we get deeper into this review). Rival Gaming has been building casino games for over 15 years, and with that experience comes a level of innovation that is required to stay relevant in this business. They are one of a handful of software vendors that still allow their licensees the ability to take U.S. action; the number seems to dwindle each year. For Deckmedia to choose Rival for Desert Nights means that they have faith the games will be attractive in a competitive, crowded market; we don’t disagree with that assessment. We really wish there were more Table Games offered at Desert Nights. 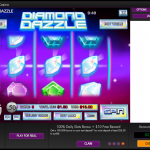 Given the fact that their parent company has relationships with 4 different software suppliers, they could have enhanced the offering by sprinkling in some more variants, especially since they do not currently offer any Live Dealer games. Now, we will say that playing Sudoku for money is incredibly attractive. For those of us who plow through them in the newspaper every day (people do this still, yes?) the idea of winning cash for completing one is enticing enough for us to give it a try every once in a while to break up a long Blackjack session. 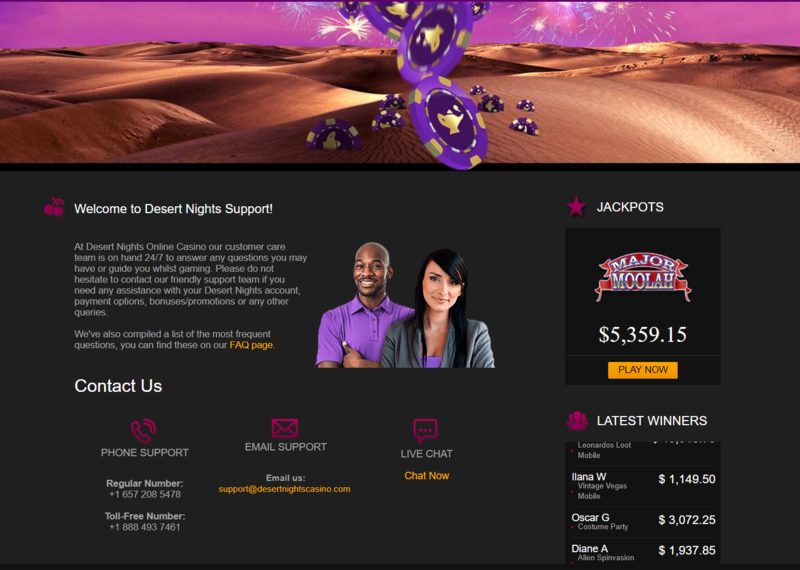 Deckmedia has always made customer service a priority for their casinos, and Desert Nights is no exception. The casino features agents available 24/7 via live chat; we tested out the system when we were poking around the website, and a representative responded within one minute. When we asked a relatively simple question (the wagering requirement for the Welcome Bonus, which we could read on the site), the agent was quick to respond with the answer and also a link to the Terms and Conditions page. You can also contact the casino via email if you want to be a little more formal, or if you really like to hear the sound of a person’s voice, then you can call the casino directly. As we mentioned off the top, when a group owns more than one casino brand, they often save time by cutting and pasting promotions across the different brands. It was a pleasant surprise to see that Deckmedia took the time to create a set of unique promotions for the Desert Nights brand; where they fell short is in the number of ongoing promotions available for players. In an increasingly competitive environment, it is important for casinos to keep their marketing fresh, especially for players who have already taken advantage of the Welcome offers. Now here is a promotion it is hard to say anything bad about. All you have to do to earn a free $10 chip is to create an account – no deposit is necessary at this stage. Now, with this free chip come some restrictions of course: there is a wagering requirement of 50x and a maximum cash out from the bonus of $170, but hey, it’s free money, they are allowed to make you work for a little. As a way to test out the games for real money, there is no better way than signing up and taking this offer. 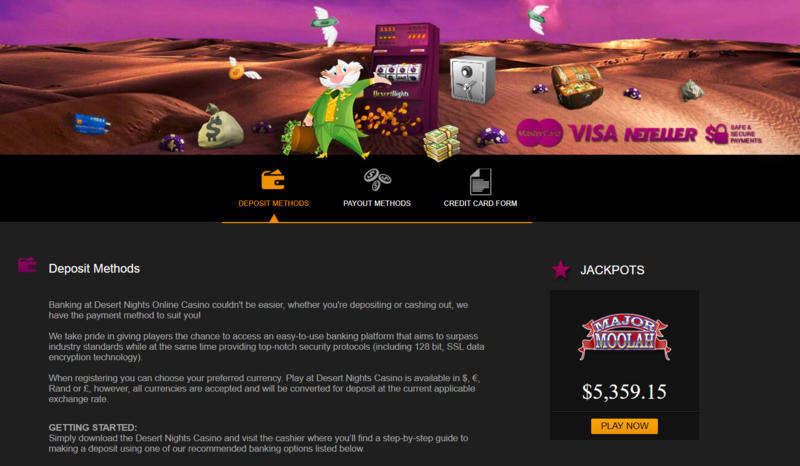 The Welcome Bonus at Desert Nights is split into three sections, giving you the chance to earn up to $2,550 in bonuses. A unique twist to this bonus is that the third stage is just a free chip, not a percentage bonus, so you don’t even have to make a third deposit to qualify! $50 FREE – 40x $50 FREE Welcome Reward! As far as recurring promotions go, we have definitely seen more variety at other casinos. The three currently listed on the Desert Nights website are all deposit reload bonuses, but one that we do like is the 177% monthly reload bonus. With this bonus, you can get up to a maximum of $885 in bonuses, but with only a 36x wagering requirement, there is a better chance you will see some of that bonus money converted into cash! It is getting harder and harder for U.S.-facing sites to process transactions from their American players. Even with approval rates of below 50% at times, processors are still charging a significant premium to take the risk of U.S. credit cards, so Desert Nights is definitely working hard to be able to provide this many options to you. Make sure you check in the cashier which payment solutions are available in your country; some have restrictions on where they will process deposits from. 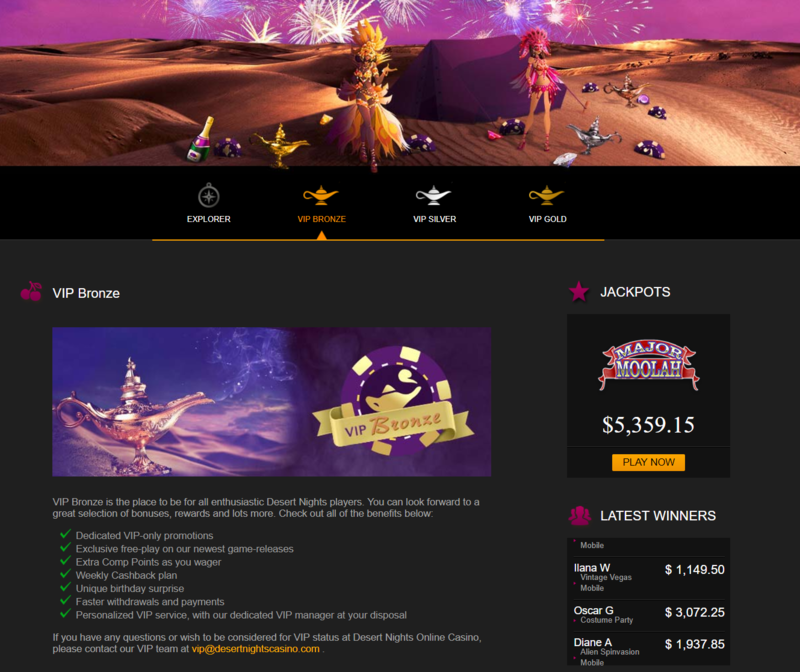 The current maximum withdrawal limit for Desert Nights Casino is $2,500 a week. I am not a big fan of casinos that restrict how much a player can withdraw; the analysis that is done on gameplay during the pending period should be enough to ensure that there isn’t anything shady being done by the player requesting the money. Desert Nights offer its players the chance to earn points while playing real money games and then convert those points into a little something extra in their wallets with their Comp Program. 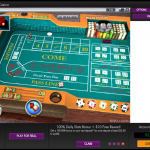 Terms of this program are straightforward; you earn points for every real money wager placed in the casino; points can be converted at the touch of a button in the cashier. The value of the points is $1 for every 1,000 you convert. We always recommend you cash them out as quickly as you can; they serve no value in your account gathering dust. So, the good news is that there is at least the structure in place to reward players as they become more and more valuable at Desert Nights. The bad news is we don’t entirely know how well you will be rewarded if you make it past the first level. We’ll do some more digging and see if we can find examples of the types of rewards each level receives. The U.S. online casino market is always in a state of flux; as it stands today, there are fewer operators than ever before willing to take the risk of accepting players from that country. However, there are still a good number to choose from, so it is important that a casino checks off all the boxes when making your selection. The folks at Deckmedia have a dozen brands that are U.S.-friendly, including Desert Nights. While I have seen more robust lists of games, this casino covers all the bases that the majority of gamblers would be looking for online. 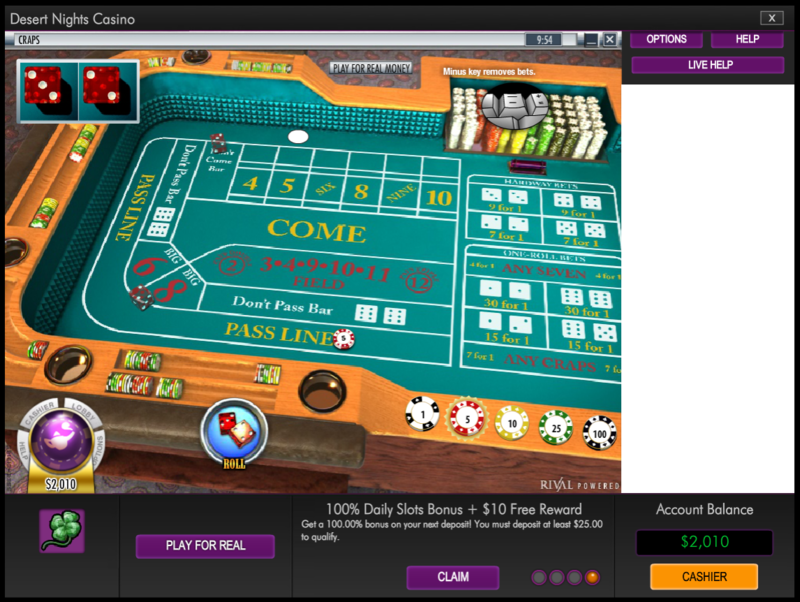 The Welcome Bonus is very attractive, and you can’t go wrong with the Free Chip just for registering an account! We had an excellent experience with their customer service team, and there are no reports of players not being paid when trying to withdraw their winnings. Overall, this adds up to a very good player experience; not the best we have come across but still good enough for us to recommend that you give Desert Nights a try. As always, we value your feedback, so if you have information about this casino or have had an experience you want to share, please send us an email to let us know!